As a direct result of producing the page on Aluminium Cored Foundation I received an Email from Brian Cramp to say that he had samples of the material. I was due to met Brian within a few days and he agreed to have the samples with him on that occasion. We met a few days later and I was surprised to see that the samples he had were not what I was expecting. 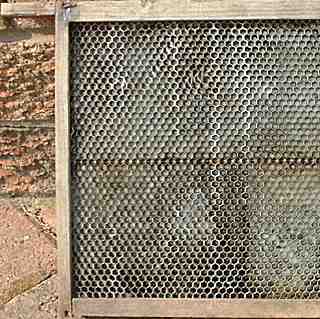 They were partial depth honeycomb complete with wooden frames. I duly sat down with my vernier calipers and made a dimensioned drawing of the two frames. One was B.S. shallow and had drone sized cells and the other was B.S. deep with worker sized cells. The two photographs have been provided by Brian and have been cut in half to save loading time. The two are reproduced at about the same scale. The frames were given to Brian in the early 1960s by Beo Cooper and apparently were common in the Derbyshire area up until that time. The drawing shown below, that I have produced from the details that I recorded, shows the method of construction. The comb is in three pieces... A central flat sheet of aluminium 0.24 mm (0.010") thickness flanked by two panels 5.00 mm thick formed like radiator cooling fins and tied together by steel tie rods that were crimped at the end. The tie rods were in the top and bottom rows of cells and in the case of the deep sheet there was a third tie rod along the central row of cells. The cells that had the tie rods in had been filled with propolis up to the level of the the level of the rod. (this can best be seen in the shallow frame photo). The whole assembly was held together by broadly grooved wooden frame parts. Worker cells... 5.00 mm pitch in horizontal direction, diagonals 4.75 mm and 4.80 mm. Drone cells... 6.35 mm pitch, diagonals both 6.20 mm. Total comb thickness... 10.2 mm in both worker and drone cases. Cell wall thickness... This was extremely difficult to measure because the aluminium was very corroded with white and grey powdery deposits. Apart from the corrosion it appeared that the strips of aluminium also varied considerably in thickness. The thinnest being 0.1 mm (0.004") the thickest was 0.2 mm (0.008") with the majority of measurements close to 0.125 mm (0.005"). It should also be appreciated that all the vertical cell walls were of two thicknesses of metal. The two thicknesses effectively reduce the worker cell bottoms to 4.9 mm, with the drone size effectively 6.2 mm. It is thought that the items were old at the time of being withdrawn from service, but I do not know how old. However the woodwork was in a worse state of decay than some samples that I have from the 1920s and 1930s. Such decay is not conclusive as I have no knowledge of the storage conditions other than that they have been in Brian's shed since the early 1960s. The samples had been used and had fragments of wax cell walls on some of the edges. The blunt square ended cells appear to have been used at this shape by the bees as there was no evidence of rounding in any of the cells other than those with tie rods in. This is partial thickness aluminium comb, I have heard of a full width version... Does anyone have any information? The material was obviously successfully used over many years, which would indicate that the high thermal conductivity was not a problem. "Since its introduction in America some four or five years ago, bee-keepers have watched with keen interest developments in the production of an artificial comb made of metal or similar thin material as a substitute for the natural comb made of wax. 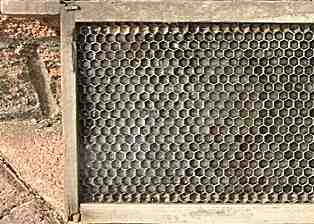 In modern intensive bee-culture the natural comb has many disadvantages. In working for run-honey, naturally built comb is too frail to stand the pull of the centrifugal extracting-machine, and it has to be reinforced by a troublesome system of wiring." That puts the date at 1918 or 1919. I wonder what the "similar thin materials" were? The material was known as "Semi-Comb" (I surmise due to it being half the thickness of a fully drawn brood comb). Tickner Edwardes mentions the conductivity of such aluminium comb, but he only uses the characteristic to "sabre rattle" on one of his pet dislikes... 'Single walled' versus 'double walled' hives.